As a typical pen tester you will generally focus on breaking the unauthorized access with your soft skills using tools like Metasploit, Backtrack, Nessus etc. However this book shows you how to break those physical barriers to get into the server room and play with it directly. In the first chapter, author describes inner components of the most typical styles of locks in use today. 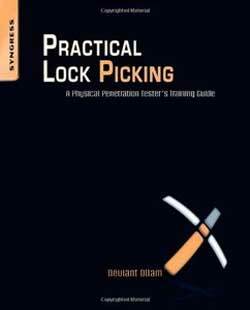 So even if you are dumb like me on such things, this chapter will set you right.Second chapter is more interesting as it shows how to use the right tools and techniques for lock picking. After this probably you can open up one of those secret safe of your grandma . Next chapter presents overview of the basic types of equipment that are particularly helpful when starting out with a study of lock picking. Chapter 4 covers the advanced topics including lock picking of pick-resistant design locks with some specialized tools and great patience. As a pentester it is important to get things done quickly, easily and cleanly. Chapter 5 shows some of those quick bypassing techniques with handy tools. Final chapter takes you down through specialized stuff and author ends with a note ‘Practice, Practice, Practice’ – only this can make you master ! While reading this book, it will be difficult for you to sit calmly and go through it, you will be tempted to look for the locks around your house and start tinkering with it. What makes this book easy to understand are the clear cut diagrams showing the internal design of locks. You will hardly find a page in this book without those design pictures and all of these are precise engineering-diagram types– not just some random lock pictures. It is very clear that author has taken great efforts to get those pictures right and this is what gives this book 5 star rank ! And finally when you are done with this book, your thoughts on Security of Locks will change forever !